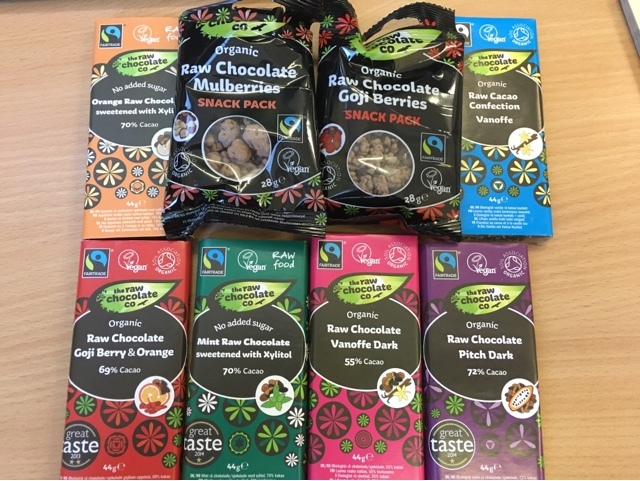 Part two of our chocolate week round up of FairTrade goodies comes courtesy of the Raw Chocolate company. We have six variations on their raw chocolate crumb, and two bags of berries dusted in raw chocolate powder. These are a little more bizarre than the previous parcel of Green & Blacks and Divine and so a little more exciting. They all take a very similar form, small bars which snap into satisfying little chunks with slightly irregular edges. We decided the pink bar with 55% strength and Vanoffe (a mix of vanilla and toffee) for a signature aftertaste was the Dairy Milk of the range and the suitable baseline. Even though this is described as dark it was very edible, and while the texture was more similar to regular chocolate than I was expecting it was good. The focus group that swarm my desk whenever it's chocolate sharing time agreed this was good, but the Vanoffe aftertaste was divisive and not liked by all. The next we tried was the 72% dark - the highest concentrated of the lot. 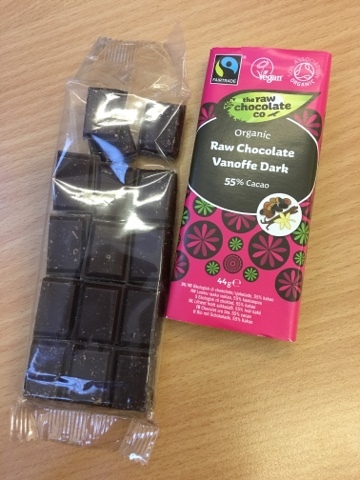 This was a very dirty dark chocolate (not quite as dispicably wonderful as the 85% bars) and one that requires a certain kind of chocolate lover to really get the most out of it. Those that liked it expressed an interest in adopting the bar once we'd finished, and while I'd like a few more cubes of this I'm not sure I need the whole bar. It is pretty special and gave me high hopes for the rest. In the opposite direction we have the 'white' 'chocolate' of the bunch - with this confection being neither white nor described as chocolate - it's a confection. This was liked by some, but met with indifference by others. I found it nice, but not as compulsive as the others. Even though this is probably the most different of the six bars I expect it to be the last that is finished. Once we'd tried the three basic bars we graduated to the variants, and started with the orange. It wasn't until after I'd had a chunk that I'd realised this was sugar free, due to the noticeable cold taste of the xylitol. A natural sweetener from Finnish bark this is the same stuff that is used in a lot of sugar free sweets and mints. I'm not convinced it works that well here, but overall it's a nice taste experience. Shortly afterwards we opened the goji berry bar. I've found these little 'superfoods' to be very hit and miss, with them being pointless trendy sultanas in some foods and well integrated taste pockets in others. Fortunately this works really well here with the fab dark chocolate and I think for a lot of people this was the favourite bar overall. With this and the pink original bar people would make return trips for more without prompting and both could be finished by now if I'd let them! I left the mint bar til last as I assumed it would be essentially just the Orange bar but with mint instead. When my parcel contained the box for the mint bars (but actually contained a selection) I was a little disappointed that I wouldn't get to try the range, turns out that might have been quite good. This is easily my winner. This has the darkness of the chocolate, the flavours of the mint, and the natural sweetener that blends the two. This means that not only is this a ridiculously tasty option (think After Eights only more so) but it's suitable for diabetics and low refined sugar diets. It's rare that the healthiest option is the preferred one, but if I'm honest I think I'd take all the bars except the Orange and Confection ones again at some point - it's a mood thing. The other thing in the box was the chocolate coated berries. We took these to the Lord Clifden pub on Friday after work to nibble on between drinks. These were a lot less popular than I'd expected, purely as they were more fruit than chocolate. 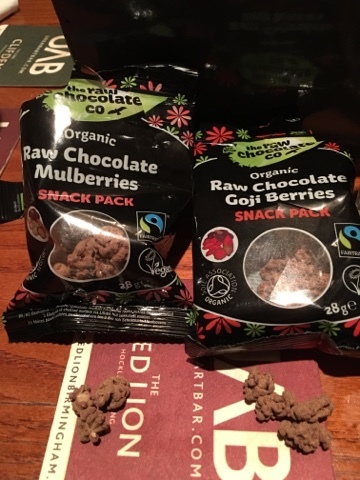 I liked both the mulberries and the goji berries with the flavours and textures being more similar to their dried counterparts than any of the choc bars. Much more something to pick at while out and about than to sit down and eat in one like crisps, I think these do have a place. Very good for sharing but they didn't have enough fans on this outing to prevent me from having to bring the rest home. While the texture wasn't as magical as the Ailee May Raw chocolate that we had, I really enjoyed these and fully intend to get more of the Mint bar both for myself and as gifts for can't have regular chocolate.